Flavor Text: "That monster's gonna pay for what he did to me." I love the Agency Criminals from a purely thematic standpoint. So cool. But I wish they were better. Crooked Cop is OK, but the rest are pretty sad. 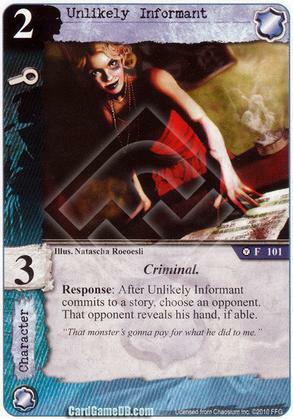 Unlikely Informant, for instance, would be a lot of fun if she also had a combat icon, if she had Toughness +1, or if she just had something else going for her.